3 WEEKS REMAIN IN OUR WINTER 2018 YOGA CLASS SERIES - SIGN UP NOW FOR $51! START A YOGA PRACTICE FOR THE NEW YEAR! EARLY SPRING 2018 CLASSES BEGIN FEBRUARY 26 - POSTCARD WILL BE COMING OUT SOON - EARLY REGISTRATION DISCOUNT THROUGH FEB. 16! BEGINNERS' YOGA 50+ CLASSES MONDAYS, TUESDAYS & WEDNESDAYS IN 2018!! Join the class anytime! Beginners and experienced practitioners are always welcome! WINTER 2018 SCHEDULE - CLASSES BEGIN TUESDAY JANUARY 2, 2018! 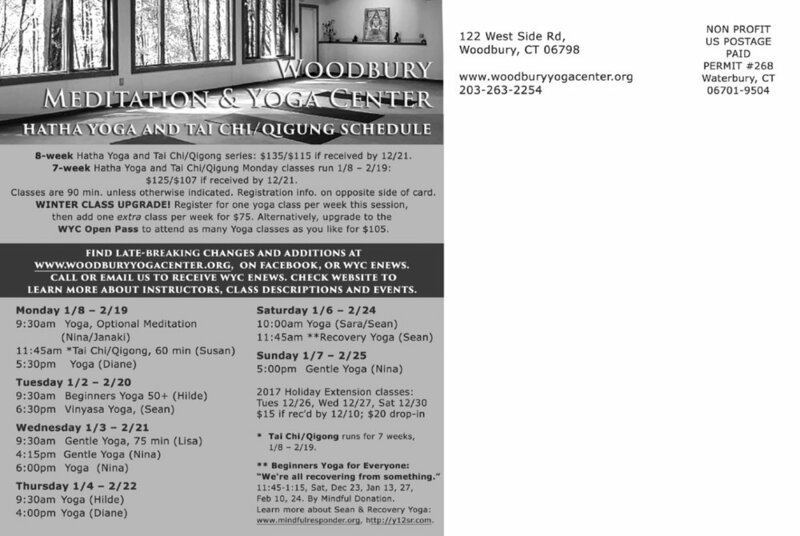 PLEASE NOTE: Tuesday 9:30 am, Wednesday 9:30 am and Wednesday 6:00 pm Yoga classes are NOT running this session.